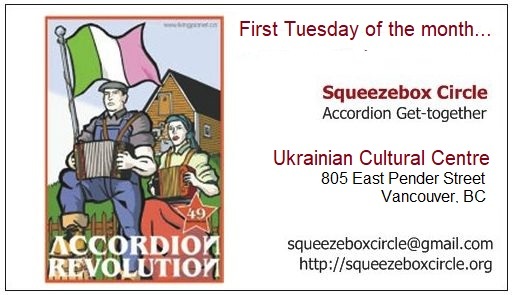 Second Thursday of every month - Black Bear Rebel Ceilidh Band - Black Bear Pub, 1177 Lynn Valley Road, North Vancouver. Third Thursday of every month - Balkan dance party - "Balkan Shmalkan headlines a night of wedding and funeral music from Balkan and Klezmer traditions. This music is largely festive, upbeat dance music, vibrantly performed on brass, reed and percussion instruments with vocals in a variety of languages. Each month also features a set by different Balkan or Kelzmer guest band. Bring your dancing shoes and be prepared to go all night." - WISE Hall & Lounge, 1882 Adanac (at Victoria). Every Friday, 6-8 pm - Breaking Boundaries Quartet, La Taqueria, 586 Hornby St.
Every Friday: 7:30 to 10:30- Alpine music accordion get together- Austria Vancouver Club, 5851 Westminster Highway, Richmond- all welcome!